Last night we came home to an unexpected visit from a bat. I don't know where it came from or how it got inside the house. I wanted to call it Eric Northman because he's my favorite vampire from True Blood this season (especially when Bill was going to kill him and he said, "Tell Sookie I was born the night she found me and because of her, I went to my true death knowing what it means to love.” Swoon). I'm not sure why I thought of True Blood since those vampires don't even turn into bats. Maybe I have been watching too much TV. Anyway, the bat was flying around all crazy and we were laughing because we had all the windows open and we were chasing it all around, but it wouldn't leave. Eventually we caught it in a sheet and Mike let it loose outside, so hopefully it will find its way home. Or start paying rent. 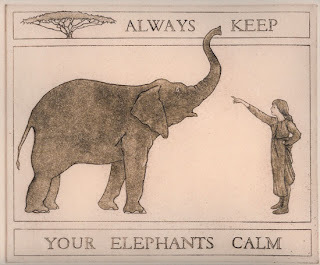 A funny end to a great weekend of running (18 miles on Saturday with Eric, Shooter & Chris and 6 on Sunday with Mike), Beatles cover band, frozen chai, Park Ave Fest (where I got a picture that says "Always keep your elephants calm." I don't know what it means, I just thought it was funny. And also good advice. Tempestuous elephants would be a lot to handle), darts and Kung Fu Panda 2. I'm getting used to the long runs. They're not necessarily getting any easier, because 18 miles is still a long freaking way to run. But I love how something that once seemed impossible is now just another Saturday morning jaunt. It makes me wonder what else I can do. Lyric of the moment: "But then came the day I climbed out of these safe limbs, ventured away..."